It seems that netizens could not get enough of the biopic ‘Heneral Luna’. Various memes had been created as inspired by the historical movie and some had even gone viral. The movie is also packed with lines that some may say as ‘hugot lines’or those that has deep meanings that might be applicable in modern life. Some created by netizens as their way to pay tribute to the late general while others had showed their wit and even created funny lines and memes. 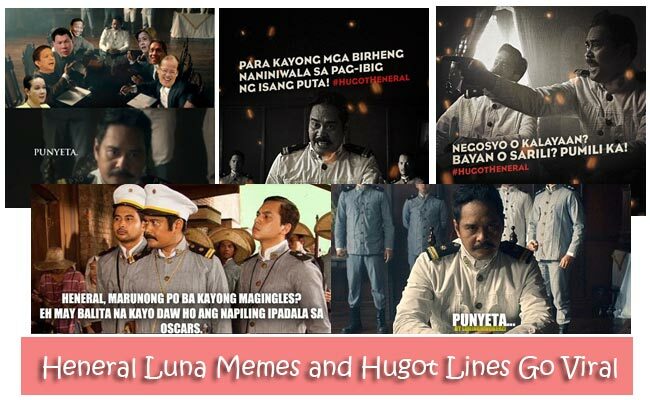 The hashtag #HugotHeneral was created and it pertains to those lines in the film that are considered provocative. Heneral Luna is the life story of General Antonio Luna and his advocacies. He was considered as the best general during the Filipino-American war, yet his death had been circulated by controversy. He was considered as arrogant and short- tempered because he does not backdown despite being put down by his fellow countrymen. During the war, the general admitted that Americans are not the Filipino’s greatest foes. He faces adversaries among his fellow Filipinos who would rather compromise and deal with the Americans rather that fight for the liberty of the country. There had been conflicts in the cabinet itself that he had asked the members if they would rather choose their selfish gains other than their country’s freedom. Due to this conflict some soldiers would only follow President Emilio Aguilnaldo. The movie shows how the general was assassinated by the soldiers loyal to the president. The biopic was suppose to only last a week in the cinemas, but this had caused online clamor. And now the movie is at its third week and still raking a lot of attention. While it is a historical movie, some say that it is very timely. ‘Heneral Luna’ is the country’s official ticket to the Oscar’s Best Foreign Language Film category. It starred John Arcilla as Heneral Luna and joined by Mon Confiado, Epy Quizon, Archie Alemania and Paolo Avelino. The movie is set to be a trilogy which will also feature the lives of Gregorio Del Pilar and Manuel Quezon.